Mastercard has dropped its name in many brand references but it’s adding a customized sound, which consumers may begin to hear soon as they pay in stores and through voice assistants. Mastercard has developed a “sonic brand” based on a specific 30-second tune, which will be customized to fit different retail environments and cultural settings around the world, Mastercard announced Friday. The move is a response to the rise of shopping via voice assistants, and it’s also an attempt to cut through clutter of up to 5,000 messages a day that besiege consumers, according to Raja Rajamannar, Mastercard’s chief marketing and communications officer. 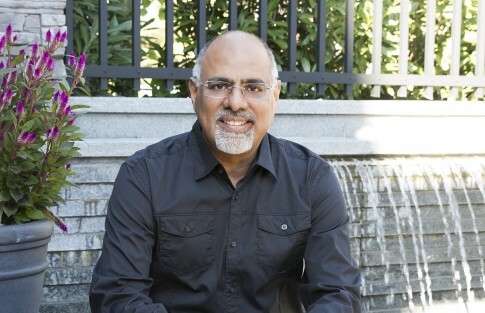 Raja Rajamannar, Mastercard’s chief marketing and communications officer. Mastercard’s data indicates that by 2020, 75 percent of households will have a digital speaker and most consumers will be using voice commands for shopping online and via the internet of things. “We’re not the first to associate a sound with transactions, but we’re the first in payments to create an end-to-end brand experience with sound,” Rajamannar said. The first retail application of the new sonic brand is a brief chime, less than two seconds long, which will play when customers complete an in-store Mastercard purchase at the Fred Segal Sunset boutique in Los Angeles, followed by other retailers in upcoming weeks. “Eventually we’ll have different kinds of sounds at different retailers; for example, you’d hear something at Gamestop appropriate to that context,” Rajamannar said. He estimates it will be a long time before many retailers adopt their own version of Mastercard’s sound. “It will be a slow rollout, maybe years,” he said. Each different sound for Mastercard’s sonic brand will be based on the core theme. The theme was developed over two years with the input of several different agencies and artists, Rajamannar said. Going forward, Mastercard’s media advertising will also feature its sonic brand, he said. So far the company has developed two dozen different variations on the theme reflecting different cultural styles and themes for Chinese, Indian, South African audiences, and operatic and cinematic approaches, he said. “It’s neutral, likable and it keeps changing in an engaging way, but it gives affirmation to consumers of the trust they have in Mastercard,” Rajamannar said. In addition to creating a connection for voice-based shopping, Mastercard wanted find a new way to stand out in a non-intrusive fashion consistent with the company’s new brand style.